Blogging Friends Blog Hop – Happy New Year! Thank you for joining us on our first 2016 Blogging Friends Blog Hop, my friend!! If this is your first blog hop – no worries, it’s easy to see everything the friends have created for you. Each of our blogs are linked to the next blog, so all you have to do is click on the ‘widget’ at the bottom of my post, and you’ll be taken to the talented Jessica Mink, who is next in line after me. If at any time a link is ‘broken’, you can scroll to the bottom of my post here, and you’ll see a complete list of participants, so you won’t miss a thing. A couple of our regular participants have had to leave our group, for personal reasons. I know that you’ll miss them as much as we will; please join me in wishing Lisa Kmiec and Christine Pochatek all the best in the future – we’ll miss you, ladies!! You should have arrived here from the awesome creations of Danica Ferrante – her projects are great, right?! 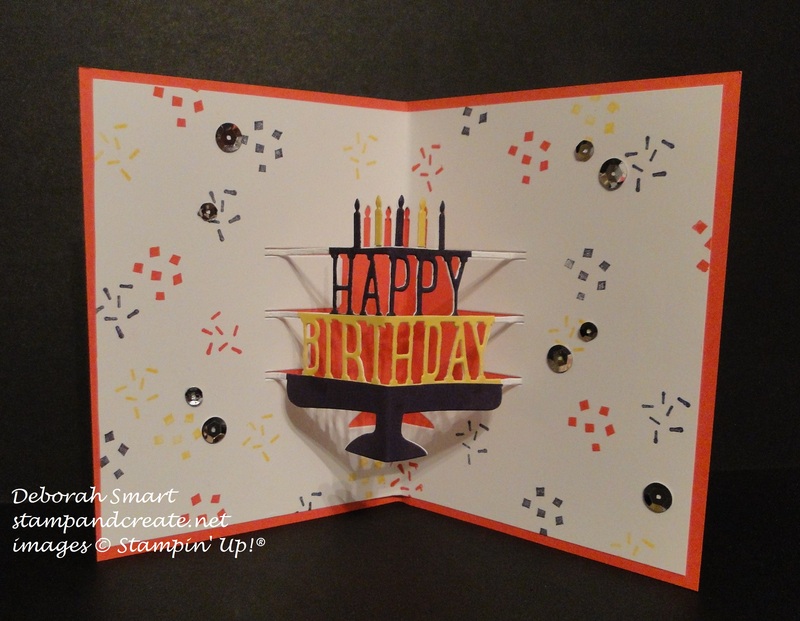 My first project is a card made with a bundle that I knew right away I was going to get – I love making fun & interactive cards, and this one was made easy by the new die set called Party Pop-Up Thinlits Dies. 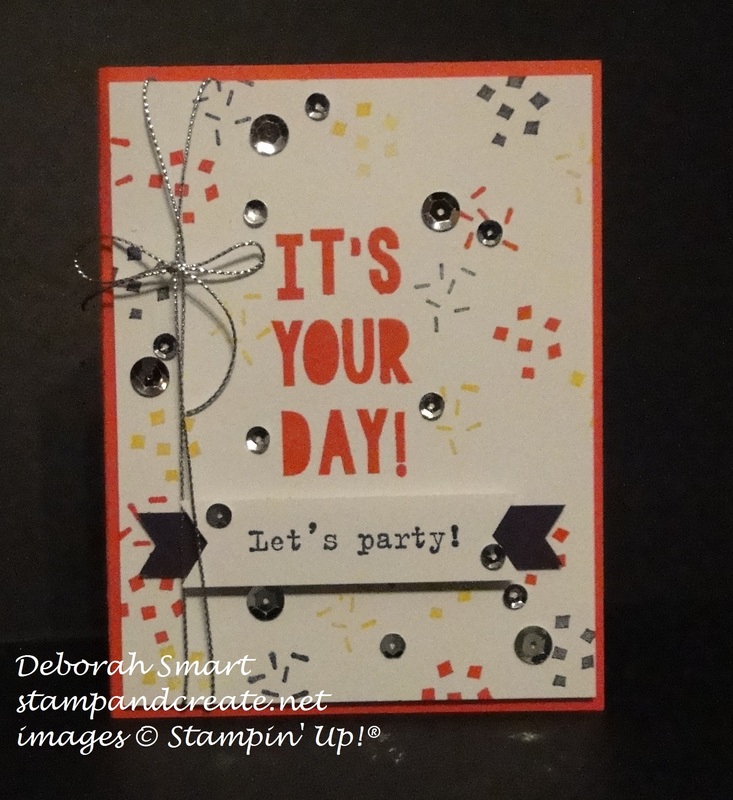 The card front is stamped using a new stamp set called Party with Cake, and it can be ordered as a bundle with the Party Pop-Up Thinlits Dies, to save 15%! The card base is Watermelon Wonder; the sentiment is stamped onto a panel of Whisper White cardstock in Watermelon Wonder ink. I then added the 2 types of confetti, included in the set, in Watermelon Wonder, Daffodil Delight and Elegant Eggplant. The ‘Let’s Party’ sentiment is stamped onto a small piece of Whisper White in Elegant Eggplant, then layered on top of a piece of Elegant Eggplant cardstock; both were punched on either end using the Banner Triple Punch. Before attaching the stamped panel to the card base, I wrapped some Silver Cording Trim around the left hand side, then tied it off in a bow. I then added some of the Silver Metallic Sequins scattered across the front. Now here’s the exciting part – the Pop Up inside! How awesome is this?! I just love how the Happy Birthday pops out, with the candles on top, and on a cake platter! 🙂 The new Party Pop-Up Thinlits are what makes the pop up; there’s another one in the set that has a ‘Hip Hip Hooray’ die cut. You can use them as they’re intended, as pop ups, or you can also use them to die cut the front or inside of a card without popping up, or cut them out and attach them directly to your card. I can’t wait to play with them a lot more! To add some extra interest, I die-cut the sentiment in first from the Whisper White insert, then I cut it 2 more times, from Daffodil Delight and Elegant Eggplant cardstock. I then snipped the words, candles and cake platter apart, and re-attached them with the Fine Tip Glue Pen (love that thing!!) for a one of a kind look! I add more confetti and sequins to the inside of the card; I think this birthday card would make anyone happy to receive it! 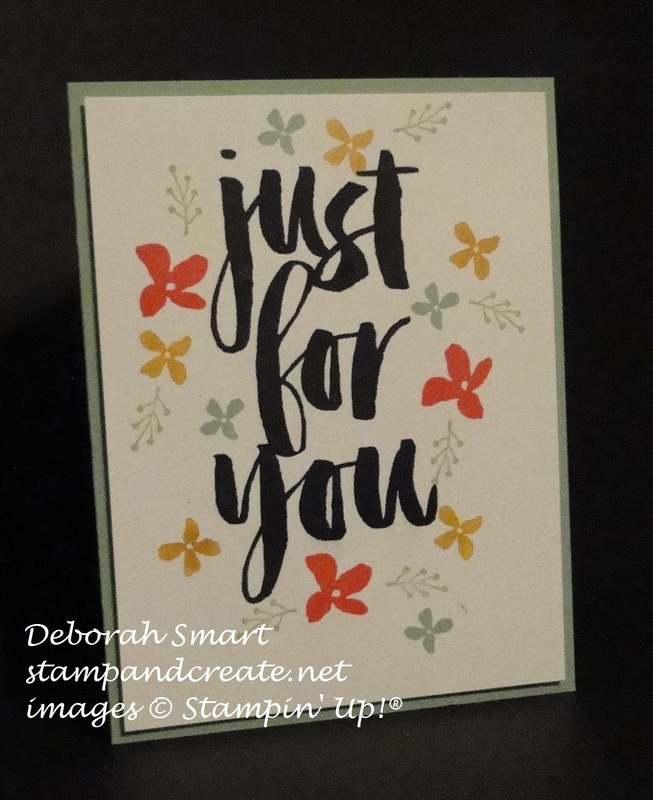 For my next project, I wanted to show off one of the FREE stamp sets that you can earn during Sale-A-Bration; It’s called Botanicals For You, and it comes with 4 sentiments and some lovely flowers and leaves. I liked the picture in the Sale-A-Bration brochure so much, I basically copied it! I did add a card base of Mint Macaron cardstock; and I stamped on a panel of Whisper White. The main sentiment is stamped in our Archival Black ink in the middle, and the flowers were stamped in Watermelon Wonder, Mint Macaron and Delightful Dijon (stamped off once). The leaves were stamped in Pear Pizzazz ink. Can’t you just see a friend opening this card, and feeling great!? I stamped the inside in Mint Macaron, and repeated the flower and leaf colours from the outside. Well, those are my 2 projects for now; I’m sure you’re dying to see what sneak peek Jessica has to share with you! Remember that the new Occasions catalogue and Sale-A-Bration start on January 5th, and you’ll be able to order and earn these, and more, great products then! Thanks for spending some time with me today, my friend! I appreciate you having a look, and I know you’ll enjoy the rest of the hop. Just click on the button below to go to Jessica’s blog. Next Next post: New Catalogue & Sale-A-Bration Start NOW! Really nice projects- I don’t have that Just for You stamp set yet! Now -ughhh you made me want it! Quick and classy cards are so great for make and takes! Thanks, Anne for your lovely comment! You know, it was the card in the SAB brochure that ‘sold’ me on the Just For You set – even I could do this clean & simple card! 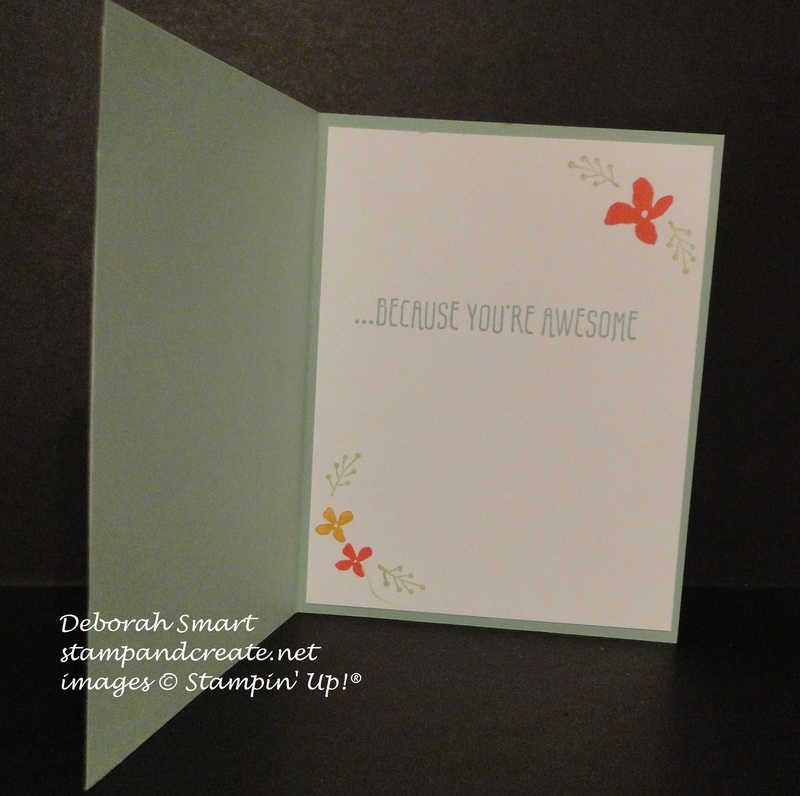 Beautiful cards Deborah! I am dying to get my hands on the Botanicals for You stamp set! It is definitely jumping on to my next order! Yay Sale-A-Bration! I’m with you, Danica – I just LOVE Sale-A-Bration!! Free is my favourite price 😉 Thanks for stopping by to leave a comment – I appreciate it! Love both your cards today! Quick, clean & fun! Can’t wait to get my new stuff! Such great cards! I’m going to miss you all too Deb! Thanks for the kind comment, Chris! We will miss your fabulous contributions to our hop, and your wonderful bubbly personality. All the best to you in 2016! So glad that you like my cards, Crystal! Thanks so much for bringing us together, and coordinating the hop each month; it’s such fun! Happy New Year to you, too! Love the cards, Deb. Especially the ‘Just for you’ card. Fabulous! Pretty cards… thanks for sharing.